1. 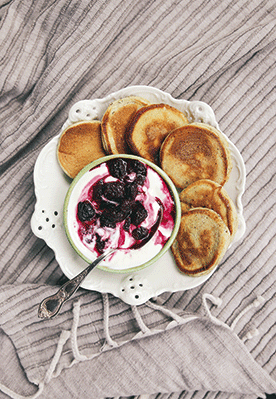 To make the marbled yoghurt, add the blackberries, honey and 60ml (2 fl oz/¼ cup) water to a small saucepan. 2. Bring to a soft boil over medium heat, then leave to simmer for 15-20 minutes, or until the blackberries are soft and pulpy. 3. Stir in the lemon juice, then leave to cool completely. 4. Carefully marble the blackberry syrup through the yoghurt using a spoon. 5. Add all the scone ingredients to a food processor or blender, then whizz until smooth. 6. Lightly grease a large frying pan over medium-low heat. Now drop tablespoons of the batter into the pan, from the point of the spoon. As soon as little bubbles start to appear, turn the scones over, then continue to cook for a further minute or so on the other side, until golden. 7. Serve the scones warm, with a dollop of the marbled yoghurt.